DrupalCamp alert: DrupalCamp Gothenburg 2013! If you haven’t been following any of the calendars listing DrupalCamps, you may have missed the arrangement that’s coming up in Gothenburg, Sweden in a couple weeks. This wouldn’t be surprising, since it’s being marketed in Swedish. People of all languages are welcome, however, so I thought I’d somewhat rehash the post I made in Norwegian. As with most DrupalCamp sites, volunteer work lies behind the site you see. A lot of people contributed really great work. Fantastic designs and solid development resulted in the site you see today. I was also involved, mostly behind the scenes. I helped with server administration, Git coordination, transferring the site to another server, and mostly with coordinating the web team’s efforts. It was the first time I had spent as much time helping organize a DrupalCamp (and I’ve been to quite a few; I’ve even volunteered at a couple). If you’re in Europe or in the area, I encourage you to check it out. You can follow them on Twitter at @DrupalGBG. I’m a mentor at the free DrupalCamp Sacramento training on June 8! I haven’t been blogging enough recently, but I will try to keep you posted with short updates at least. It’s been a busy first quarter of the year! But I wanted to post to announce that I’m mentoring this training, which as I write is tomorrow. It’s full, so this is sure to be an interesting experience on my part. BuildAModule.com’s site is here (affiliate link). DrupalCamp Sacramento: link (Fill PDF Service is a Bronze Sponsor). I’ve been to several camps this summer and early fall, but I haven’t really written anything about them since I mentioned sponsoring DrupalCamp LA 2011. I’ve decided that I’ll probably never document them individually but that a combined blog post would be reasonable. I’ll write this soon, probably next week (once things calm down a bit). You’ve probably already read my spiel on sponsoring, so I’ll spare you. I’ve just sponsored DrupalCampLA 2011 at the Community level (meaning I donated $100). You can look at my sponsor page here: DrupalCampLA 2011 WizOne Solutions sponsor profile. On May 7, I attended a code sprint in San Diego. Fortunately, Jerad Bitner has already blogged about this. Given that, I’ll share my experience and impressions rather than the event breakdown. My previous code sprint was at SANDCamp 2011. That one was different in that the goals were planned out in advance and most of the time was spent writing code. In contrast, most of the time in this first COD sprint was spent planning, tweaking make files, and re-building feature modules. Porting an installation profile is a bigger job than writing a module, that’s for sure! I mostly worked on researching the state of COD’s dependencies and updating the make file and groups.drupal.org wiki page accordingly. The sprint was fun, and I’d do it again. It’s even better that the sprint helped move it forward. I’ll be sprinting again at DrupalCon London, so look for me! A neat thing about raffle prizes at Drupal meetups is the community aspect. Sometimes you win a prize for which you have no use and can give it back for use at another meetup. This happened to me a couple months ago at the Downtown L.A. Drupal meetup. I won some online design-related training that I couldn’t use. I passed it on, and I suppose someone at the LA Drupal meetup received it. 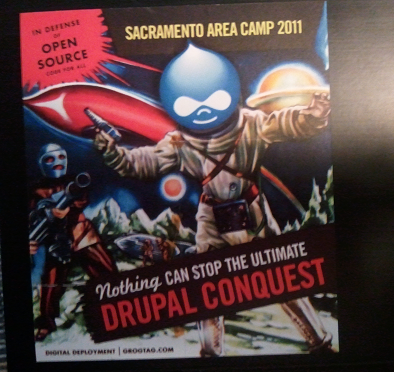 This weekend, I attended the first DrupalCamp in the Sacramento, California area. It happened to be held in Davis, a location which worked for me. Some of you might know that I was talking about taking Amtrak’s Coast Starlight up to the Bay Area. I indeed did. Here’s some pictures: (flickr link coming soon; I have to upload the pictures). But as for the camp itself, it’s best to break it down into the sessions I attended and then give my overall impressions. As every attendee certainly did, I started off my day listening to Nate Haug (@quicksketch)’s keynote speech. He talked about the community, contributing, contributing productively, collaboration, and the care shown to community members. It was a good start. After that, I went to my first session. The title of this presentation had intrigued me, and I’m glad I checked it out. Adam Kalsey (@akalsey) of Tropo did a fantastic job of demonstrating the VoIP module and how command sets could be sent to phone systems using PHP code. This was a neat presentation as well. It was also presented by Adam Kalsey. His thesis was essentially that Drupal is an application development platform that ships with a great CMS as its default implementation. He defended this fairly, outlining many of the subsystems that I indeed deal with regularly. Ben Shell gave a fascinating presentation on the topic above. I found this very useful, as it cleared up some questions I had regarding the whole thing. I liked how he spoke a bit about how to get drupal.org to fully package your distribution or installation profile for download! Some dude who came from L.A. gave this one. I think his name was Kevin Kaland or something. Of course it was awesome; would I say otherwise? Fortunately, you don’t have to listen to me; Doug R. Wu has given a brief “str8up” account of the talk. That coupon code expires Monday, by the way. Saturday ran late for some reason, and I got lost on the way back to campus, so I rolled in around 11 AM. I discovered that no organized code sprint was happening, so I worked more on adding Webform token support to Fill PDF on Drupal 7. This is completed now. I wrapped up my camp with Mike Hathaway’s Nagios talk. It was cool; Nagios is definitely a tool l will have to try some time, along with the Drupal Nagios module of course! So ended my camp, and so began my transportational journey back…with a new sticker on my laptop! DrupalCon London 2011 – WizOne Solutions Individual Sponsor Page Now Live! That link in the other post shouldn’t be showing access denied anymore. They published my sponsor page and are showing Individual Sponsors on the main Sponsors page now! I appreciate it, DrupalCon team!